Not quite pear butter, and to substantial to be a jam, the large chunks of sweet pears still have a fresh taste and the almost honey like syrup has just a hint of fall, making this the perfect toast topper and scone side-kick for a crisp October. If you are mildly intimidated by making jam, this is a great recipe to start with. It doesn’t take all day and has a very approachable ingredients list that make something that tastes like it took a great deal more work. A single recipe doesn’t make enough to justify full-on canning so I divided it up among little jars saved from pesto, artichoke hearts and roasted red peppers. I left about 1/2 inch of head room and put them in the freezer. You could easily double or quadruple it for hot water canning. In a large heavy saucepan combine the apple juice concentrate with the vanilla bean, cinnamon stick and the water. Boil over moderate heat for 10 minutes. Remove the vanilla and cinnamon and add the pears and their liquid. Bring the mixture to a boil over moderate heat and cook, stirring frequently, about 45 minutes, or until the mixture thickens enough to hold its shape on a spoon. If you have a kitchen thermometer it should reach nearly 220 degrees. Spoon the jam into sterilized jars and seal, or refrigerate/freeze when cool. 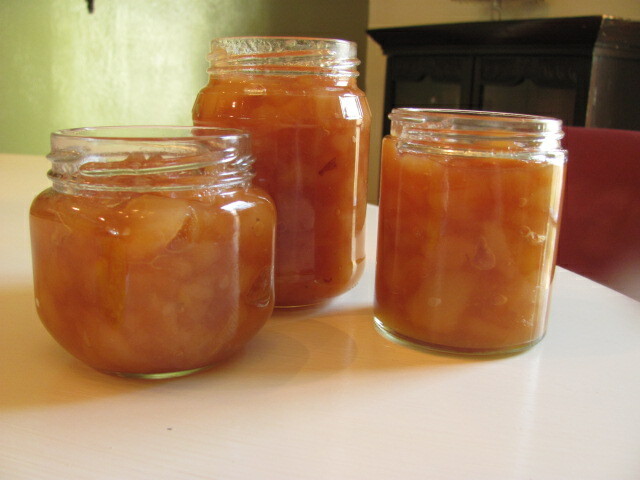 This entry was posted in Fruit, Preserving and Canning. Bookmark the permalink.